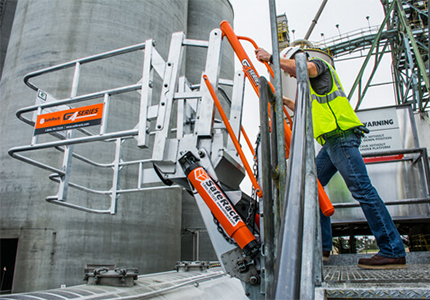 SafeRack’s patented access gangways and loading rack systems and equipment are designed for maximum safety, ergonomics, productivity and lower maintenance. Loading Rack Gangway Designed for Enhanced Safety and Reliability. The #1 selling Gangway in North America. Made in the USA, SafeRack's railcar gangways, truck gangways, and marine gangways, are reliable, highly engineered & safe. 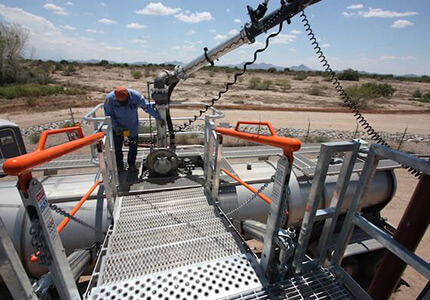 SafeRack designs, builds and installs safe, ergonomic and efficient loading platform gangways for small and large businesses throughout North America. Backed by years of experience and a hands-on, collaborative approach, the patented solutions are delivered on time, every time. And, just as important, they come within budget and without hassles. Call for an on-site visit to make sure you get gangways that fit and work as you expect. SafeRack representatives visit your site and help with complex retrofits or new greenfield applications. SafeRack’s SAS loading platform gangways are more ergonomic and last longer. Tested in the most critical applications, these loading platform gangways outperform all others. In addition to multiple lengths, the SAS is available in 24″, 36″, 48″, 60″ and 72″ widths. Adding fall protection cages is easy, and customized designs are available to meet difficult applications. The SFR is a flat ramp loading platform gangway with a simple design that’s ideally suited for hopper car applications. It works particularly well when the platform height and the vehicle height are equal to each other. The SFR has a slip-resistant walk surface and comes standard with a hot-dipped, galvanized-steel base tread. 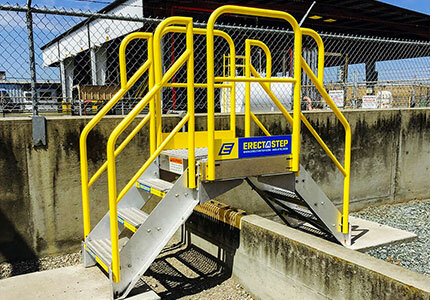 Popular for railcar applications, our FRT loading platform access gangways extend to increase safety and access. With rugged, oversized parts the access gangways are built to stand up to years of abuse. And they feature counterbalanced, adjustable springs that help raise and lower the units with minimal effort. Our boat and ship gangways are built to order to your required length and specifications. Constructed of durable aluminum, galvanized or stainless steel, they’re readily available in sizes ranging from 90′ in length to 5′ in width—and vessel gangways exceeding those dimensions can be designed and built if your application requires it.